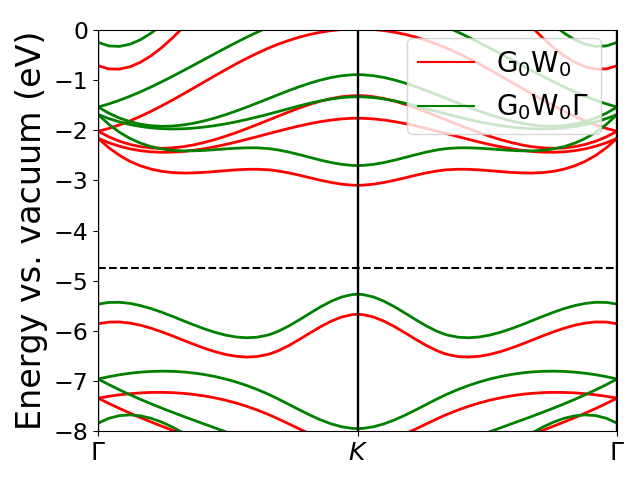 For a brief introduction to the GW theory and the details of its implementation in GPAW, see Quasi-particle spectrum in the GW approximation: theory. In the first part of the tutorial, the G0W0 calculator is introduced and the quasi-particle spectrum of bulk diamond is calculated. First, we need to do a regular groundstate calculation. We do this in plane wave mode and choose the LDA exchange-correlation functional. In order to keep the computational efforts small, we start with (3x3x3) k-points and a plane wave basis up to 300 eV. It takes a few seconds on a single CPU. The last line in the script creates a .gpw file which contains all the informations of the system, including the wavefunctions. You can change the number of bands to be written out by using calc.diagonalize_full_hamiltonian(nbands=...). This can be useful if not all bands are needed. Next, we set up the G0W0 calculator and calculate the quasi-particle spectrum for all the k-points present in the irreducible Brillouin zone from the ground state calculation and the specified bands. In this case, each carbon atom has 4 valence electrons and the bands are double occupied. Setting bands=(3,5) means including band index 3 and 4 which is the highest occupied band and the lowest unoccupied band. All the values are ndarray’s of shape (spins, IBZ k-points, bands). with the result: 6.96 eV. The G0W0 calculator is used is used to calculate the quasi particle energies through the G0W0 approximation for a number of states. GPAW calculator object or filename of saved calculator object. Base filename of output files. File that stores data necessary to restart a calculation. List of indices of the IBZ k-points to calculate the quasi particle energies for. Range of band indices, like (n1, n2), to calculate the quasi particle energies for. Bands n where n1<=n<n2 will be calculated. Note that the second band index is not included. Same as bands except that the numbers are relative to the number of occupied bands. E.g. (-1, 1) will use HOMO+LUMO. Plane wave cut-off energy in eV. If set to True an automatic extrapolation of the selfenergy to infinite cutoff will be performed based on three points for the cutoff energy. If an array is given, the extrapolation will be performed based on the cutoff energies given in the array. Number of bands to use in the calculation. If None, the number will be determined from :ecut: to yield a number close to the number of plane waves used. Sets whether the Godby-Needs plasmon-pole approximation for the dielectric function should be used. Kernel to use when including vertex corrections. Where to include the vertex corrections; polarizability and/or self-energy. ‘GWP’: Polarizability only, ‘GWS’: Self-energy only, ‘GWG’: Both. Cutoff for density when constructing kernel. 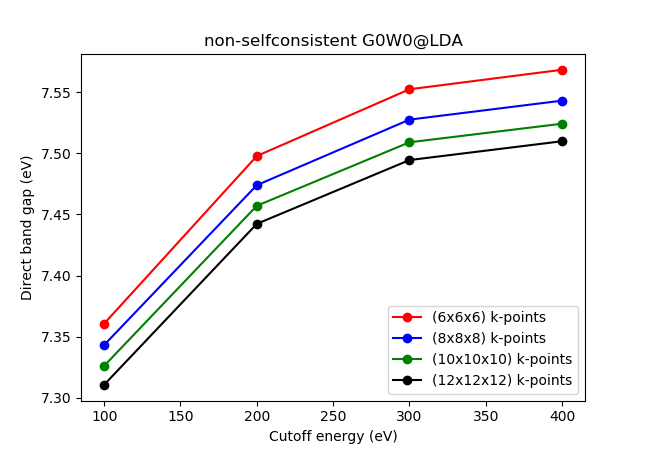 When carrying out a calculation including vertex corrections, it is possible to get the standard GW results at the same time (almost for free). Gap to apply in the ‘JGMs’ (simplified jellium-with-gap) kernel. If None the DFT gap is used. Method to integrate the Coulomb interaction. 1 is a numerical integration at all q-points with G=[0,0,0] - this breaks the symmetry slightly. 0 is analytical integration at q=[0,0,0] only - this conserves the symmetry. integrate_gamma=2 is the same as 1, but the average is only carried out in the non-periodic directions. Energy (in eV) used for fitting in the plasmon-pole approximation. Minimum frequency step (in eV) used in the generation of the non- linear frequency grid. Control parameter for the non-linear frequency grid, equal to the frequency where the grid spacing has doubled in size. Shift Fermi level of ground state calculation by the specified amount. Analytic correction to the q=0 contribution applicable to 2D systems. Old term for the q0_correction. Number of blocks chi0 should be distributed in so each core does not have to store the entire matrix. This is to reduce memory requirement. nblocks must be less than or equal to the number of processors. Cuts chi0 into as many blocks as possible to reduce memory requirements as much as possible. Save W to a file. Save output to a pckl file. G0W0 or GW0(eigenvalue selfconsistency in G) currently available. Number of iterations in a GW0 calculation. Number between 0 and 1 determining how much of previous iteration’s eigenvalues to mix with. Carries out the extrapolation to infinite cutoff automatically. Can we trust the calculated value of the direct bandgap? Not yet. A check for convergence with respect to the plane wave cutoff energy and number of k points is necessary. This is done by changing the respective values in the groundstate calculation and restarting. Script C_ecut_k_conv_GW.py carries out the calculations and C_ecut_k_conv_plot_GW.py plots the resulting data. It takes several hours on a single xeon-8 CPU (8 cores). The resulting figure is shown below. Next, we should check the quality of the frequency grid used in the calculation. Two parameters determine how the frequency grid looks. domega0 and omega2. Read more about these parameters in the tutorial for the dielectric function Frequency grid. Running script C_frequency_conv.py calculates the direct band gap using different frequency grids with domega0 varying from 0.005 to 0.05 and omega2 from 1 to 25. The resulting data is plotted in C_frequency_conv_plot.py and the figure is shown below. 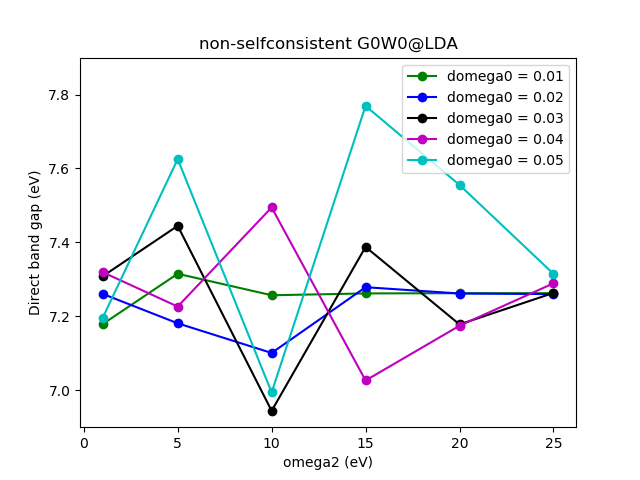 Converged results are obtained for domega0=0.02 and omega2=15, which is close to the default values. A full G0W0 calculation with (8x8x8) k-points and extrapolated to infinite cutoff results in a direct band gap of 7.57 eV. Hence the value of 6.96 eV calculated at first was not converged! Another method for carrying out the frequency integration is the Plasmon Pole approximation (PPA). Read more about it here Plasmon Pole Approximation. This is turned on by setting ppa = True in the G0W0 calculator (see C_converged_ppa.py). Carrying out a full \(G_0W_0\) calculation with the PPA using (8x8x8) k-points and extrapolating from calculations at a cutoff of 300 and 400 eV gives a direct band gap of 7.52 eV, which is in very good agreement with the result for the full frequency integration but the calculation took only minutes. If a calculation is very memory heavy, it is possible to set nblocks to an integer larger than 1 but less than or equal to the amount of CPU cores running the calculation. With this, the response function is divided into blocks and each core gets to store a smaller matrix. How to set up a 2D slab of MoS2 and calculate the band structure can be found in MoS2_gs_GW.py. The results are not converged but a band gap of 2.57 eV is obtained. To appear in Physical Review B. Including vertex corrections is currently not possible for spin-polarized systems. Which kernel to use: xc='rALDA', xc='rAPBE' etc..
How to construct the kernel: av_scheme='wavevector' or av_scheme='density'. The wavevector scheme is preferred here. How to apply the kernel: fxc_mode = 'GWG', fxc_mode='GWP' or fxc_mode='GWS'. Carrying on from the ground state calculation in MoS2_gs_GW.py, a \(GW\Gamma\) calculation can be done with the following script: MoS2_GWG.py. The \(GW\) and \(GW\Gamma\) band structures can be visualized with the MoS2_bs_plot.py script resulting in the figure below. Here, the effect of the vertex is to shift the bands upwards by around 0.5 eV whilst leaving the band gap almost unaffected. When carrying out a \(G_0W_0\Gamma\) calculation by specifying the 3 keywords above, the do_GW_too = True option allows for a simultaneous \(G_0W_0\) calculation. This is faster than doing two seperate calculations as \(\chi_0\) only needs to be calculated once, but the memory requirement is twice that of a single \(G_0W_0\) calculation. The \(G_0W_0\Gamma\) results will by default be stored in g0w0_results.pckl and the \(G_0W_0\) results in g0w0_results_GW.pckl. The results of both calculations will be printed in the output .txt file. It is currently possible to add eigenvalue self-consistency in the Green’s function. This is activated by setting method='GW0', specifying how many iterations you are interested in, maxiter=5 and optionally also how much of the previous iteration’s eigenvalues you want mixed in, mixing=0.5 . Usually 5 iterations are enough to reach convergence with a mixing of 50%. Only the bands specified will be updated self-consistently. The bands above(below) the highest(lowest) included band will be shifted with the k-point averaged shift of the band below(above). The results after each iteration is printed in the output file. The following script calculates the band gap of bulk BN within the GW0 approximation: BN_GW0.py. 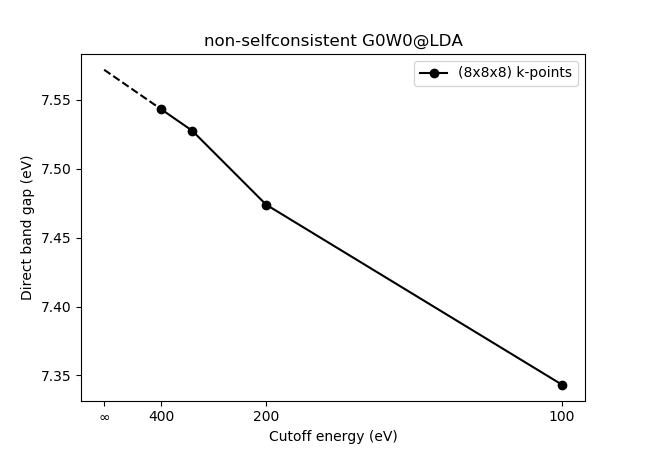 The figure below shows the value of the gap during the first five iterations, where iteration zero is the DFT gap (BN_GW0_plot.py). Note: The calculations are not converged with respect to k-points, frequency points or cutoff energy.